To say that the couple hours spent in Lithuania’s Museum of Genocide Victims was sobering would be quite an understatement. It was an incredible collection and exhibition; it was tremendously moving. And there were parts which were more than a little spooky. 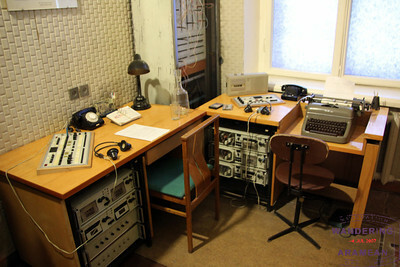 The museum is housed in part of the building which formerly served as the KGB’s operation headquarters in Vilnius. It had served as a courthouse and military headquarters for other occupying forces in the prior years and a prison as well. 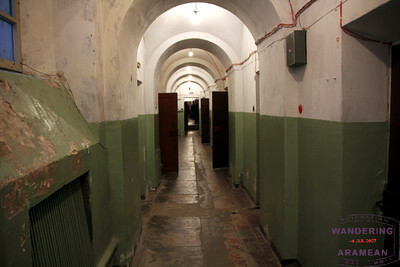 That role – a prison – is one it would continue to operate as for decades during the era of Soviet rule. Today the façade is mostly the same, though with a small addition. The stones on the front of the building are now marked with the names of those who were tortured and killed inside. It is a stark reminder not just of the number of people who were killed but also how young many of them were and that, in many cases, families were destroyed together. One of the many names carved into the facade of the building, reminding visitors of those who perished inside. Inside the museum are several exhibits split across three floors. Part of the exhibit covers the unarmed resistance to Soviet rule in the region. Arm bands of the resistance. Another section goes into detail about the deportation process. 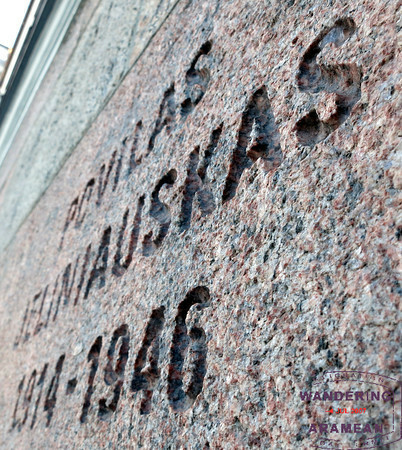 Hundreds of thousands of Lithuanians were deported or killed in the first half of the 20th century. And it isn’t that large nor populous a region to begin with. The devastation that these actions brought on the region was immense. There are stories recounted of the efforts some made to be repatriated, only to then be deported again. There is a section devoted to the internal spying KGB members conducted against those who lived in the region. Nearly all activity was monitored in one way or another. Several “listening rooms” were set up in the building to allow KGB operatives to tap in to the phone calls of nearly everyone. The equipment still in place when the building was abandoned was reasonably modern for the early 90s, I suppose, though there was clearly an old-school vibe to much of it. 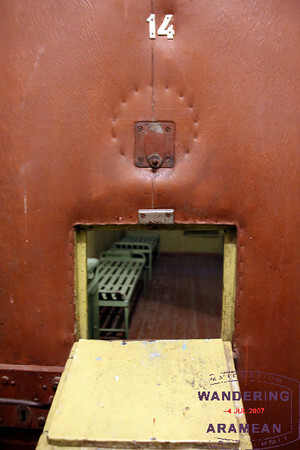 Yet another portion of the exhibit – in the basement – allows visitors to explore the prison cells as the prior inhabitants did. Guard posts and other bits were left intact and walking down the narrow hall and exploring the individual rooms left quite an impression on me. I think the worst part was looking in the cells and thinking, “at least there is a decent amount of space,” until I read the placard which noted that each cell would often hold 15-20 prisoners at a time. It was nowhere near reasonable. Visitors are also able to walk out of the cell block into the recreation yard. It is a tiny outdoor area in a central courtyard with more cells built in the space. No room to move or exercise; just a bit of fresh air and high walls. Adjacent to the yard was the execution room. 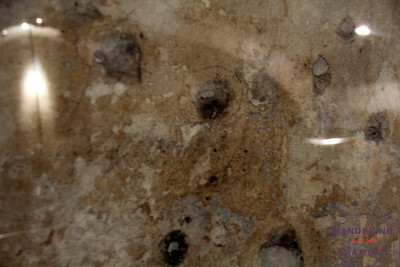 The walls are still pock-marked with bullet holes. This was, by far, the most disturbing part of the exhibit to me. It was a great way to spend a couple hours, but also one of those visits I wish I’d never had the opportunity to make. Not because I’m sad I saw the results, but because it is quite a shame any of it happened in the first place. If you’re in Vilnius for any stretch of time it is hard for this not to be a “must-do” part of the trip. More photos on Google+ and Facebook. More stories available from the Baltic Beers trip, too. Vilnius, is a great city to visit. My fav of the Baltics. Their friendly, and is like Scandinavia at less then half the price. I have been to Vilnius several times and it is a thoroughly charming and modern city. However moving, the Genocide Museum tells a partial story. At the start of the 2nd World War Vilna (Vilnius) had a Jewish population of about 100,000 (45% of the population of the city) and was the center of Jewish learning with the great Vilna Gaon as leader. The holocaust started in Lithuania on 23 June 1941 with many of the non Jewish population complacent or participating in the deportations and killings. Ultimately 96% of Lithuania’s Jewish population was killed; the highest proportion in Europe. Many more would have died if not for Senpo Sugihara; sometimes called the “Japanese Schindler”. There is a small monument to him in Vilnius. Sadly the Genocide Museum sanitizes the truth about the holocaust in Vilnius. Next time you visit I suggest that you visit the Green House, hidden away on Pamėnkalnio 12. Here you will find the rest of the story. I generally agree with Bruce but talking about the Holocaust and the Jewish genocide doesn’t tell the complete story. Central Europe was a battlefield of two totalitarian systems fighting each other and creating many social cleavages. Vilnius was at the center of all those ethnic conflicts. Before the WW2, it was a Polish city with predominantly Polish population and substantial Jewish minority. After the war, Stalin moved the borders with dummies Roosevelt and Churchill passive. Poles and Jews were mostly gone, killed or expelled. Lithuanians fought Poles as a threat to their national identity and Jews whom they perceived as supporting communism. The resulting alliance with the Nazi lead to several pogroms and massacres, the biggest of them being the Ponary (a suburb of Vilnius) massacre, with est. 70K Jews, 20K Poles and 8K Russians killed jointly by Germans and Lithuanians . 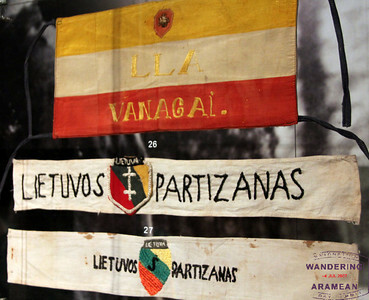 Lithuania, unlike Poland, is firmly nationalistic and reluctant to give the honest account of ethnic struggles within its borders, including Lithuanian WW2 cleansing activities.